This dvd is filled with six action-packed episodes featuring lesson learning storylines and positive messages for preschoolers everywhere. The chuggers as always deliver a heart warming story that is sure to make any pre-preschooler smile. “Brewster Leads The Way” releases February 11, 2014, just in time for Valentine’s Day! This dvd will release in two different versions, including one with an Old Puffer Pete die-cast engine from TOMY. 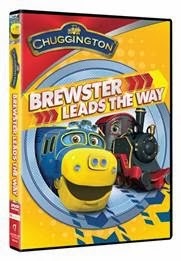 In the title episode, Brewster must oversee the transporting of a heavy load with the assistance of the other Chuggers. But, when the Chuggers get called away or breakdown, it’s up to Brewster to move “full-steam ahead” and finish the job! And, in “Track Laying Brewster,” when a flash flood causes Rocky Ridge River to overflow, Brewster’s track-laying abilities are put to the test. He has to save Zack, Tyne and Fletch by helping them get their wheels above water quick.